This pack contains 48 high-quality origami sheets printed with 8 different traditional Japanese samurai images. For the first time, origami papers feature traditional Japanese ukiyo-e prints of samurai warriors. 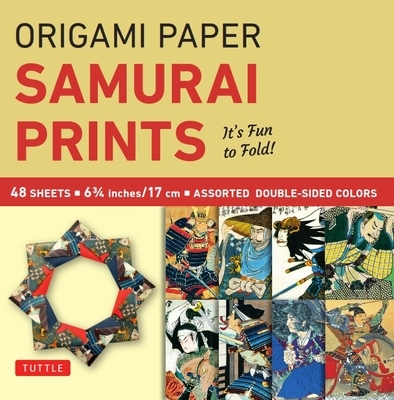 These beautiful collections of samurai origami paper prints will add a Japanese flair and authenticity to your folded origami models and paper craft projects like nothing else. They are perfect for origami folding, gift wrapping, and scrapbooking. The Tuttle Publishing Company was established in 1948 in Rutland, Vermont and Tokyo, Japan and is today regarded as a premier publisher and seller of books rooted in Asian culture, language and history. Since its founding in 1948, Tuttle has published more than 6,000 books and today maintains an active backlist of around 2,000 titles. Today, Tuttle publishes 150 new titles each year focusing on Asian languages, Asian food & cooking, gardening & flower arranging, crafts & origami, children's books, martial arts, Asian literature, games & graphic novels, Asian history & culture, health & fitness, self-help & Eastern religion, Asian art & collectibles, interior design & architecture, travel guides, maps, and business books. Tuttle products are available in printed formats as well as popular eBook formats.